This is a screen used crystal shard from the 1982 film The Dark Crystal directed by Jim Henson and Frank Oz. 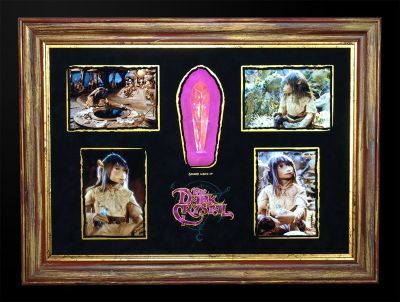 The plot revolves around Jen, an elflike “Gelfling” on a quest to restore balance to his alien world by returning a lost shard which is found to be part of the Dark Crystal, and must be reinserted to restore the Crystal's integrity. This shard can be seen in the film being held by Jen and was obtained from the Jim Henson Creature Shop. In the film’s finale Jen inserts the shard into the Crystal and the dark palace begins to crumble away and transform into a castle of bright crystal. This causes the Mystics and Skeksis to merge into tall glowing beings, one of whom says "we are again one" and the land is shown rejuvenated and the Castle transformed into a palace of crystal. The shard was displayed with a purple back light that when switched on, makes the shard appear that it's glowing as it did in the film.